The April Daring Cooks Challenge was brought to us by Joanna from What’s On The List. She taught us all about Pathiri and challenged us to create our own version of this inspirational Indian dish! I made a Chatti Pathiri.Chatti pathiri if you are not familiar with it is basically layered pastry or crepes made in the North Malabar and Malabar region, of Kerala, India. It is made in both sweet and savoury variations. The dish is very similar to the Italian lasagna in concept but instead of pasta; pastry sheets / crepes are used. The filling depends on the variation desired. The sweet ones are made with sweetened beaten eggs, nuts and raisins, seasoned with cardamom. The savoury ones are made with a meat filling. 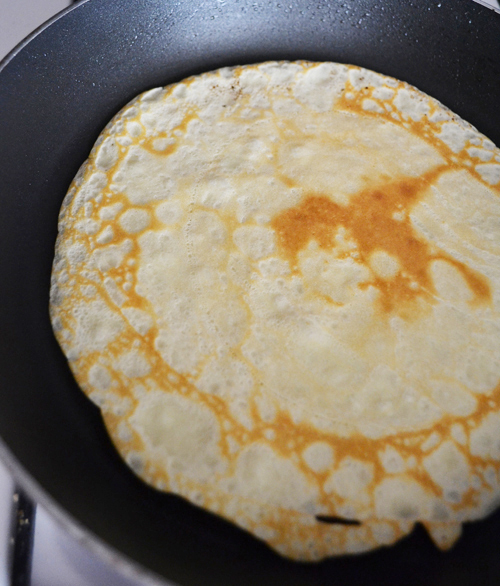 Traditionally pathiri crepes are made out of rice flour, but like many traditional recipes, new adaptations use different types of flour and different crepe recipes. Having tried a savory crepe in one of our sourdough surprises challenges, I was really looking forward to this month’s challenge and it did not disappoint. 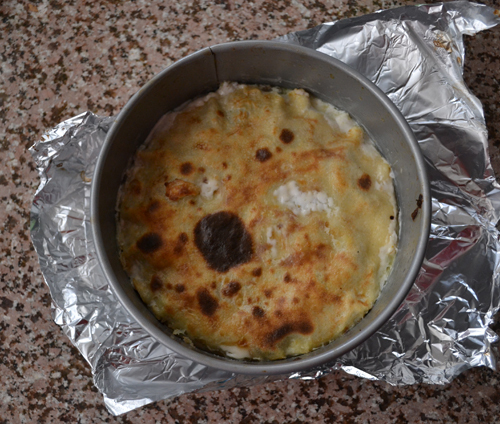 The Pathiri was almost like a lighter lasagna with Indian flavors. We all loved it but the kids loved it so much that they were actually looking forward to the left overs the next day!Thank you Joanne for an amazing challenge. I served my pathiri with a quinoa salad on the side. I stuck to Joanne’s Chatti Pathiri recipe with a few changes. I doubled the crepe recipe because I wanted more layers and I increased the amount of chicken used and added some mushrooms as well. 1) In a jug or mixing bowl add vinegar to milk; allow to sit for 5 minutes. 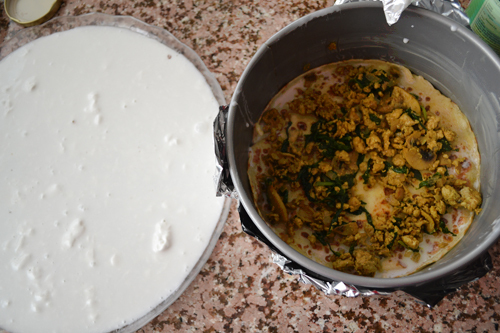 2) In a bowl (or larger jug), combine milk mixture with remaining ingredients; refrigerate for at least one hour. 3) Heat pan coating pan lightly with butter; remove excess with paper towel. 4) Pour batter to desired size; flip when edges start to lift. Do not pour batter into a pan that is not hot enough as it WILL stick. 1) Cut chicken into bite size pieces and remove any excess fat. 2) Place in a food processor and mince; set aside. 3) Place almonds in a pan; roast under grill (broiler) for 5 minutes or until lightly toasted; remove. In a food processor or mini grinder, grind almonds until fine; set aside. 4) In a small bowl, combine turmeric powder, coriander powder, and roasted curry powder; set aside. 4) In another small bowl, combine ginger paste, garlic paste; set aside. 5) Prepare (i.e. dice) red onions; set aside. 6) With all ingredients now prepared, heat a large fry pan on medium heat, then add 1 teaspoon ghee. 7) Add ginger, garlic paste; sauté for 30 seconds. May need to lower heat “slightly” if pan ingredients start to splatter. 8) Add red onions; sauté for about 5 minutes or until soft; move onions to one side of pan. 9) Add in powdered spices to opposite side of pan; sauté for about 1 minute; combine with onions. 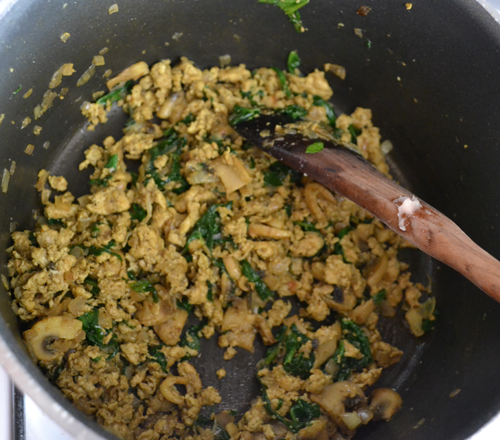 10) Add the mushrooms, sautee for 10 minutes then add the chicken mince; sauté until brown. 11) Add finely ground roasted almonds. 12) Add a good handful of spinach (or more); allow to wilt; approximately 3 minutes. 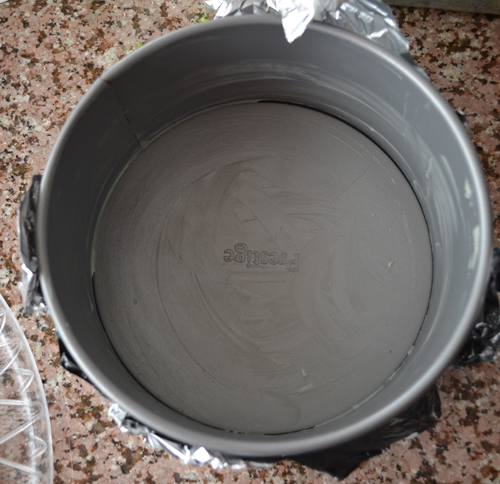 13) Remove mixture from the heat; set aside until completely cool; about 30 – 40 minutes. In a bowl, pour your coconut milk ; set aside. 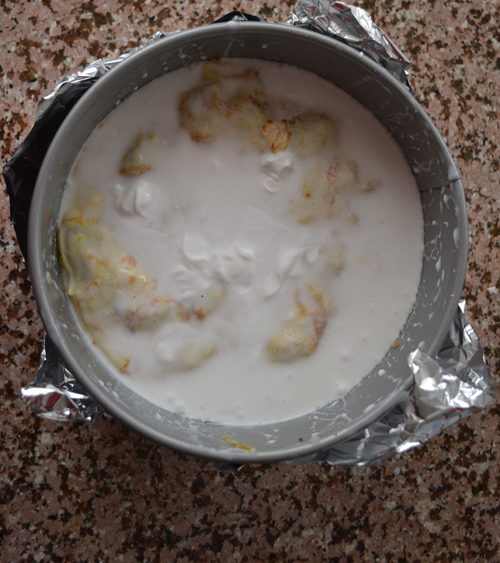 Place your chatti pathiri in a preheated moderate oven 350°F/180°C/gas mark 4, until all the coconut milk evaporates; you will notice the side “starting” to become dry. Posted in Chicken, Daring cooks and tagged Chatti pathiri, chicken, coconut milk, crepe cake, crepes, daring cooks, indian recipes, light lasagna, mushrooms, Pathiri, savory crepes, spinach. Bookmark the permalink. G’day Your Chatti Pathiri looks absolutely wonderful Sawsan! Congrats on completing this month’s Daring Kitchen Cooks Challenge! It was an ABSOLUTE pleasure being your host! Sharing the love today too! LOVE your photos and thank you for always inspiring me too! I’ve never tried anything like this but I’m eager to give it a go. I know Joanne makes some nifty things and I’ll never get caught up trying to make them all but I am going to try this one. Your photos are stunning. Your plated slice looks temptingly delicious! love your photos, as always. I had never heard of this dish before as being part of Indian cuisine. 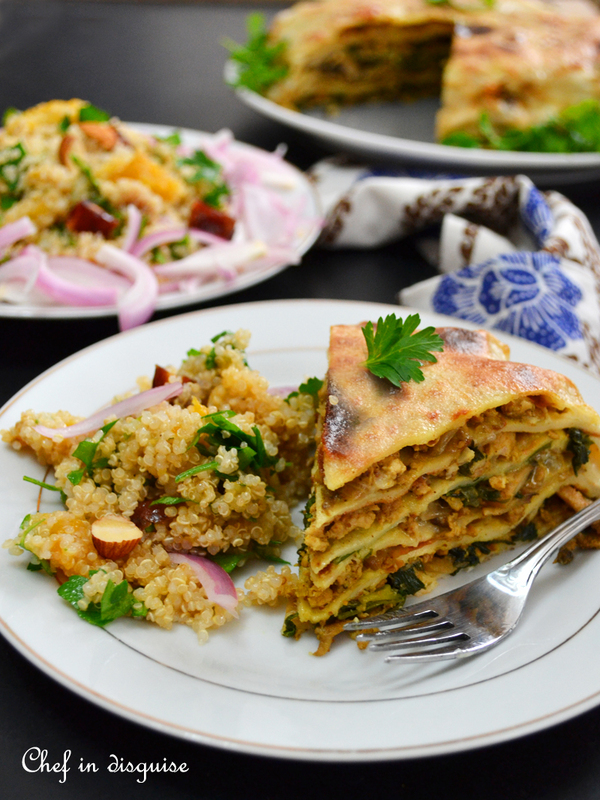 It has elements of the Moroccan bastilla in it where the crepes do the job of a type of phyllo pastry. Very intriguing. We have to make this for sure Sawsan! Not only will the kids love it, but I’m sure I will too. I also love anything with leftovers. They are essential to our weekly routine. 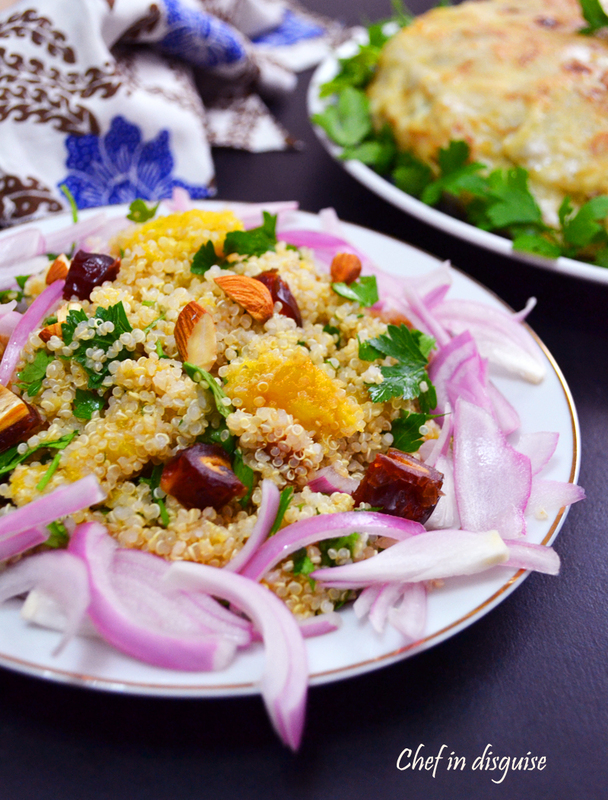 🙂 I love your quinoa salad too – looks very bright and flavorful. 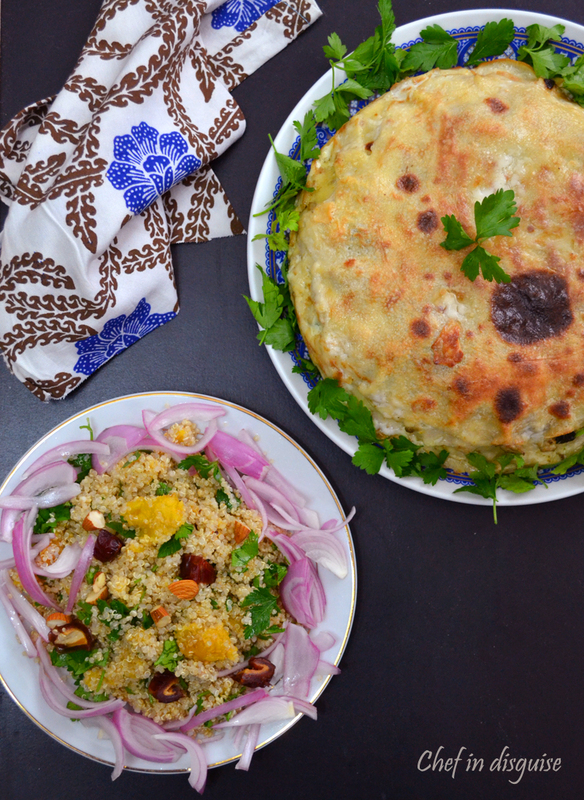 Your chatti pathiri looks outstanding, alone with the fruited and flavorful side-dish, Sawsan. This is a dish I am not familiar with Sawsan, thank you for the introduction. I bet we would love these flavours too, but I am very intrigued by the presentation, it’s really beautiful. Your kids sound like they would be a joy to feed (or at least the stories about them that get on the blog!). I’m putting this on my list of things to try out, it would make a perfect lunch at the cottage for a group! What a beautiful pathiri! I think I’m going to try this one next. Love the ingredients and the spices!!! Love the idea of the 8″ cake pan! Wow, Sawsan! That dish looks really delicious and mouthwatering! It reminds me of the Egyptian Roqaaq with beef filling! I just can’t wait to try this yummy looking dish! What a lovely stacked dish! All of these recipes look incredible! Where do you find them? I love all sorts of stacked dishes – with pancakes, crepes, tortillas but, at the end of the day, it all depends on what is between them and this looks pretty good. Ohh my goodness, this sounds absolutely divine!!! I can not wait to try this, it looks amazing!! !